Are you cheering on your favorite team? 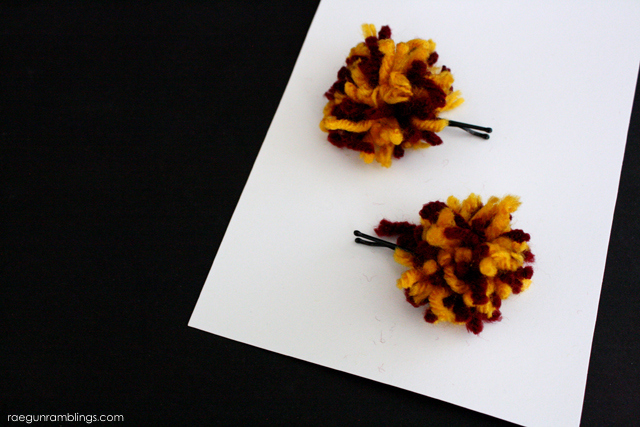 How about do it in style with pom pom hair clips? 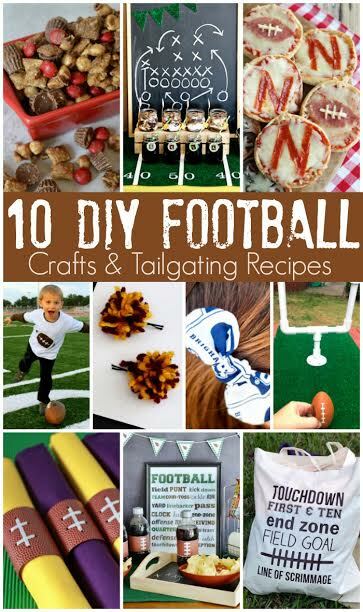 I’ve joined up with a bunch of other bloggers for a fun Football Craft and Recipe round up! My project is so easy all you need is some scrap yarn, bobby pins, and about 2 minutes. If you’ve never made a pom pom it’s super easy and there’s something really soothing about the process. You might find yourself addicted. You can make them for all sorts of crafts and DIY party ideas. Start by wrapping your yarn around something. If you’re using more than one color I like to do it at the same time so the colors will be well mixed. For the hair clips I wrap the yarn around two fingers. For bigger pom poms like those I put on my Bam Bam Baby Costume hats I wrap the yarn around my palm. Wrap it until it’s nice and full. Then slide the bundle off keeping the folds. Tie another piece of yarn around the middle of the bundle. Double knot. 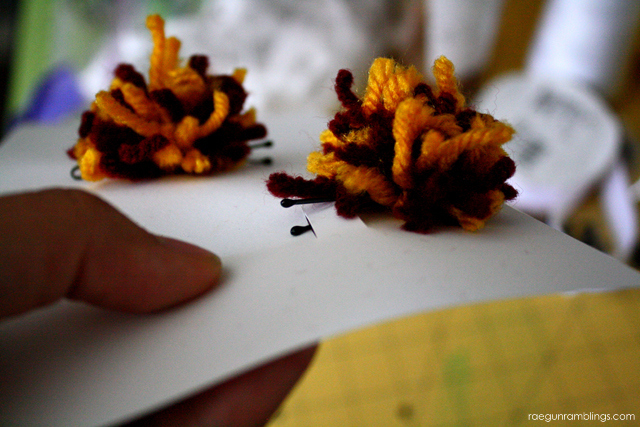 Finally cut the folds to make your pom pom. 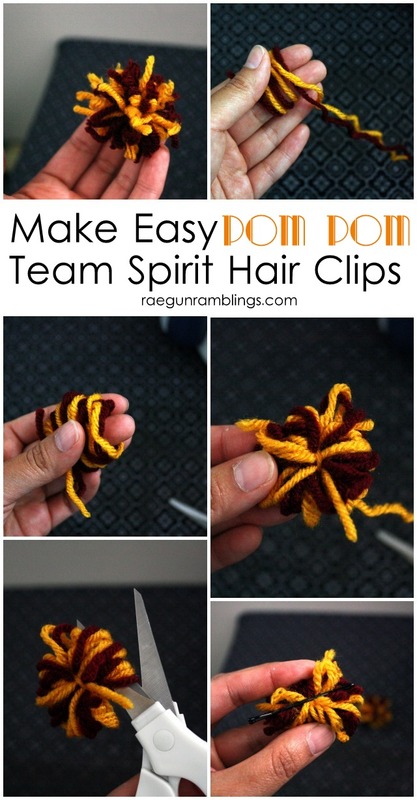 To make it a hair clip all you have to do is slide a bobby pin under the tie piece of yarn and you’re good to go. Crazy easy right? Now you can share your team pride any where you go! 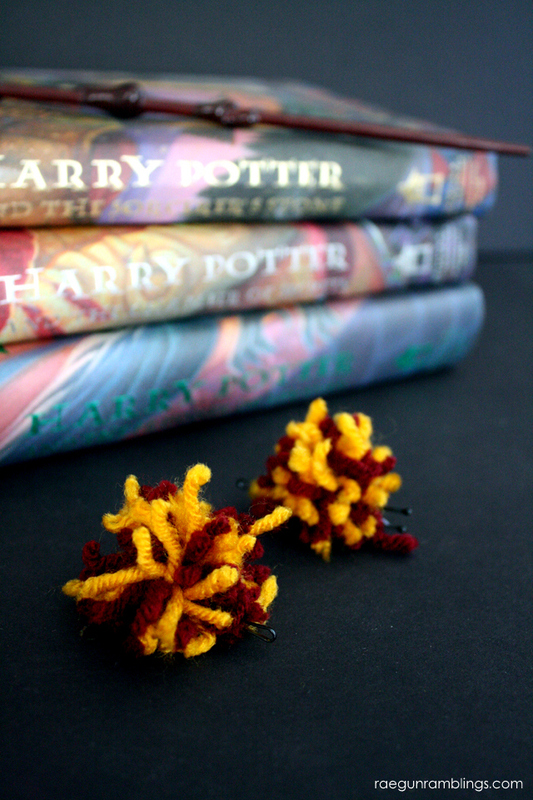 So whether you are cheering on your favorite football team or quidditch team you can do it in style!